The Mekong River is the 12th largest river in the world flowing 4,350km from SW China to discharge into the sea through a vast delta in Vietnam. Discharging 16,000 cubic meters per second this great beast of a river actually flows through or marks the boundaries of six different nations: China, Laos, Burma, Thailand, Cambodia and Vietnam. Navigable approximately 3,000km in high water from Saigon to Stuc Treng in Cambodia and again above the Cambodia Laos border formed by the impassable Khone Falls, the river is navigable from Pakse all the way to Jinghong in China. In French colonial times it was said that for officials taking up postings in Laos it took longer to sail up the Mekong from Saigon to Luang Prabang than it did to sail from Paris to Saigon. In fact, the French built a railway round the Khone Falls to connect steamer services above and below. Passengers of our famous Mekong river cruises experience enormous cultural and ecological diversity on this magnificent river. However, both ways of life and the biodiversity of this vast region will be affected by the construction of a number of new dams. Seven are planned for Laos alone, with one nearing completion. Our ship already passes through in a specially-constructed lock. Though flowing through six countries there is a far greater human diversity than merely six nationalities. Numerous minority groups and hill tribes have settled along the banks, from the Chams in Vietnam to Akas, Lisus, Shans, Dai and many others the further up you go into the Highlands. All of this makes for a truly fascinating ethnography. 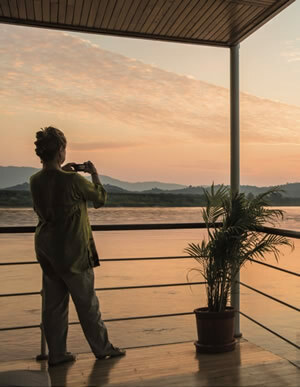 Pandaw operates three Mekong river cruise ships on the Lower Mekong and Tonle rivers through Vietnam and Cambodia and from Laos to China on the Upper Mekong.